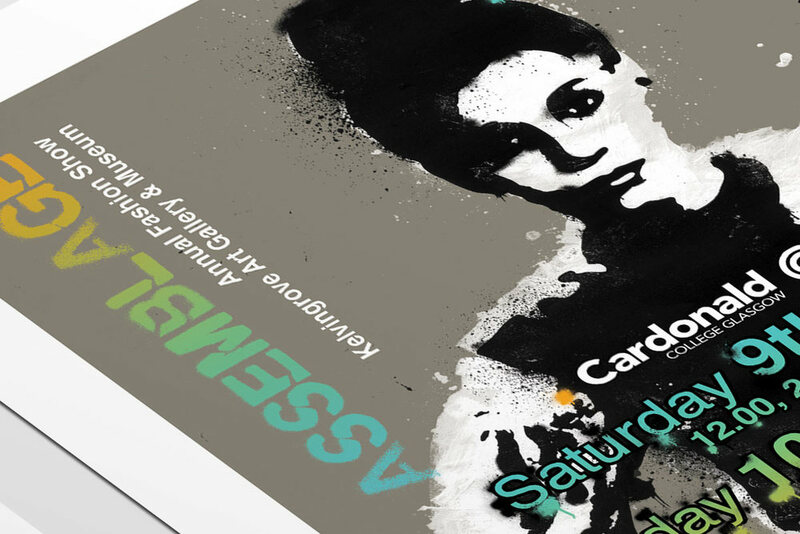 I produced this artwork for the Cardonald Fashion Show taking place at Kelvingrove Art Gallery and Museum. The organisers wanted the artwork to match the attitude and tone of the garments on display. So I decided to create a street art illustration. The visual was created by using imagery taken from the previous year’s fashion show and digitally creating stencils from that. These were then printed out, stressed, sprayed and painted over. The resulting artworks were then scanned back in to be digitally edited. The typography followed the street art theme and I created a stencilled identity for the show. The artwork was applied to promotional material for the event as well as merchandise and some limited edition screen prints sold at the show.